Early in the semester, students in my "Black Nerds" course were reading Colson Whitehead's The Intuitionist. Folks had no trouble viewing the novel's protagonist Lila Mae as a black nerd. She's bookish, isolated and in solitude, and apparently socially awkward. But what about Huey Freeman? 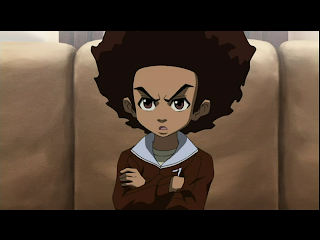 We've been reading Aaron McGruder's The Boondocks comic strip and talking about his 10-year-old protagonist as a black nerd. Huey is as nerdy as Lila Mae in many respects, but there are some key differences that have gotten our attention. Most notably, Huey's bookish-ness is linked to consciousness, African American history, and black nationalist ideas. He's like a pint-size Malcolm X and suspicious of Eurocentric ideas in ways that are uncommon among the most popular African American nerds Steve Urkel and Carlton Banks. Not only is Huey suspicious of Eurocentricism. He often speaks out against "the white supremacist power structure." He's brainy and militant, and he's a child who never smiles. His reason for unhappiness is not because of particular personal slights, but instead, he is deeply dissatisfied with the state of the world and burdened because he carries the weight of black America on his shoulders.